I've been rocking "All the Young Dudes" a lot lately. Such a good record. "All the Young Dudes" is regarded by many as one of glam rock's most famous, most perfect anthems. The song originated after David Bowie came into contact with Mott the Hoople's bassist Pete Watts and learned that Mott was ready to break up due to continued lack of commercial success. Bowie was a big fan of Mott and wanted to help them out. He persuaded them to stay together, and offered them "Suffragette City" from his then yet-to-be-released "Ziggy Stardust" record. Mott didn't like "Suffragette" and so Bowie immediately wrote "All the Young Dudes" allegedly on the floor of a London flat right in front of Ian Hunter. 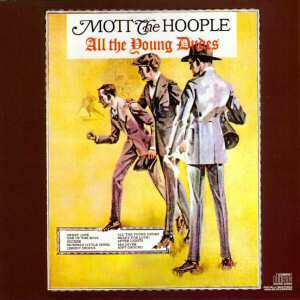 Mott the Hoople's single was released in July 1972 and shot to #3 on the UK charts, resuscitating their career for a few more years until an exposé in NME said Mott's original singer and then road manager Stan Tippens was actually singing the chorus of "All the Young Dudes", from a hidden microphone backstage. "Diary of a Rock'n'Roll Star" is Ian Hunter's famous written-as-it-happened account of Mott the Hoople's 1972 U.S. winter tour. It chronicles the endless traveling, hotels, sound checks, performances and, notably, strips away the glittering facade of the rock star that the music industry PR machine would have us believe. It's an amazing book, especially if you've ever toured in a band. Word up. See Also: Marc Bolan/T.Rex, Queen, Bryan Ferry/Roxy Music, Brian Eno, Slade, Alvin Stardust and Gary Glitter. 2 days ago I was humming All the Young Dudes for no apparent reason, and then - whoosh - there it is on your blog.